Our online Auto Repair Specials include the services you are looking for! Here’s a list of what you’ll find. 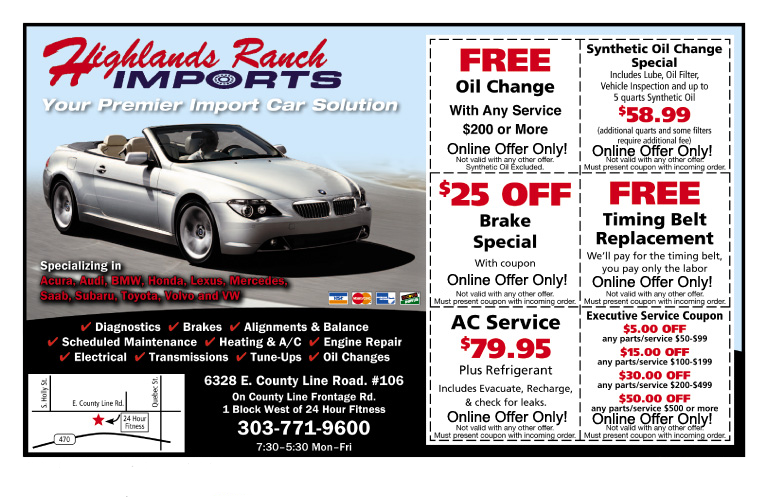 Just print out the coupon and bring in in with you to our shop. You’ll be on your way to taking advantage of these savings! We look forward to servicing your auto needs! 6328 E. County Line Road, #106 on County Line Frontage Road, one block west of the 24 Hour Fitness between Quebec and Holly. We're located at 6328 E County Line Road on County Line Frontage Road 1 block west of the 24 Hour Fitness between Quebec and Holly.